In 2006, The U.S. Food and Drug Administration announced that products containing trans fatty acids require stringent nutritional labeling. In December of the same year, New York City became the first city in the nation to ban artificial trans fats at all restaurants. Small amounts of trans fat occur naturally in beef and dairy foods. Artificial trans fats are made when hydrogen gas reacts with oil. They can be found in cookies, crackers, icing, potato chips, stick margarine and microwave popcorn. About 80 percent of trans fat in American's diet comes from factory-produced partially hydrogenated vegetable oil. Trans fats pose a higher risk of heart disease than saturated fats, which were once believed to be the worst kind of fats. Saturated fats raise total cholesterol levels. Trans fats elevates the risk by only raise total cholesterol levels but also deplete good cholesterol (HDL), which helps protect against heart disease. Older women whose diets include a substantial amount of trans fats are more likely than their counterparts to suffer an ischemic stroke, a new study shows. However, the risk of stroke associated with trans fat intake was lower among women taking aspirin, according to the findings from University of North Carolina at Chapel Hill researchers. The study, "Trans Fat Intake, Aspirin and Ischemic Stroke Among Postmenopausal Women," was published Thursday (March 1, 2012) online in the journal Annals of Neurology. The study of 87,025 generally healthy postmenopausal women aged 50 to 79 found that those whose diets contained the largest amounts of trans fats were 39 percent more likely to have an ischemic stroke (clots in vessels supplying blood to the brain) than women who ate the least amount of trans fat. The risk was even more pronounced among non-users of aspirin: those who ate the most trans fat were 66 percent more likely to have an ischemic stroke than females who ate the least trans fat. However, among women who took aspirin over an extended period of time, researchers found no association between trans fat consumption and stroke risk – suggesting that regular aspirin use may counteract trans fat intake's adverse effect on stroke risk among women. Video: What are Trans Fats? 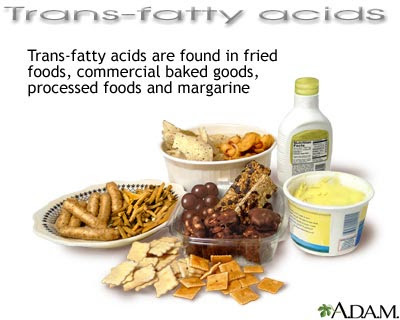 Trans fat is generally created in the food production process and is found in commercially prepared foods, including many shortenings, cake mixes, fried fast foods, commercially baked products (such as doughnuts, cakes and pies), chips, cookies and cereals. Researchers from the UNC Gillings School of Global Public Health studied women who were enrolled in the Women's Health Initiative Observational Study. From 1994 to 2005, 1,049 new cases of ischemic stroke were documented. Women who consumed the highest amount of trans fat also were more likely to be smokers, have diabetes, be physically inactive and have lower socioeconomic status than those who consumed the least trans fat, the study showed. "Our findings were contrary to at least two other large studies of ischemic stroke," said Ka He, Sc.D., M.D., associate professor of nutrition and epidemiology at the UNC public health school. "However, ours was a larger study and included twice as many cases of ischemic stroke. Our unique study base of older women may have increased our ability to detect the association between trans fat intake and ischemic stroke among non-users of aspirin." He said aspirin may lower the risk of ischemic stroke because of its anti-inflammatory and anti-platelet clumping properties. The UNC researchers did not find any association between eating other kinds of fat (including saturated, monounsaturated or polyunsaturated fat) and ischemic strokes. "Our findings highlight the importance of limiting the amount of dietary trans fat intake and using aspirin for primary ischemic stroke prevention among women, especially among postmenopausal women who have elevated risk of ischemic stroke," said lead author Sirin Yaemsiri, a doctoral student in the school's epidemiology department.